Meanwhile more than a year ago i imported extensive data in OpenStreetMap for Antarctica much of which is showing the delineation of ice and ice free areas. Still none of the widely used OpenStreetMap based maps is showing this data. This is primarily because land ice is mapped in Antarctica in a way different from elsewhere on the globe. Ice is abundant in Antarctica and ice free areas are very small so the ice free areas are mapped rather than the ice covered parts. The rendering systems need to be specifically adapted to this convention for correct results. If this is not done the results look more or less like in the main map on openstreetmap.org which is incorrect and misleading. Since the ice is not shown below zoom level 6 anyway and map users rarely zoom to this scale in the Antarctic this error is not much known but it is quite obvious for anyone who actually tries to use the map in the region. To make it easier for map developers to fix this problem i put together a script that generates geometries representing the ice covered areas which can be used supplemental to the normal OSM glacier data. 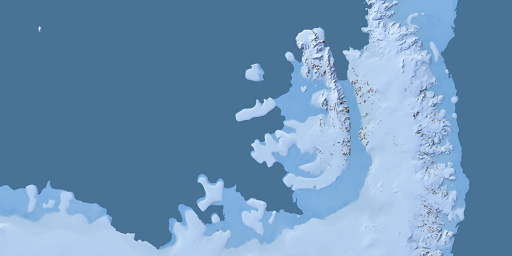 If you add the shapefiles generated with this script to your map and style them the same way as normal glaciers the resulting map will accurately represent the current mapping of Antarctic ice in OpenStreetMap. This approach is similar to the one used for the coastlines – it is a preprocessing step turning the raw OSM data into a representation better usable in rendering than the original data. In fact the Antarctic ice processing builds heavily on the results of OSMCoastline. I would like to emphasize that for maps aiming for real time updates on changes using this approach, even with regular updates of the data, is not ideal because of the delay it adds to changes to turn up in the map as known from the coastlines. 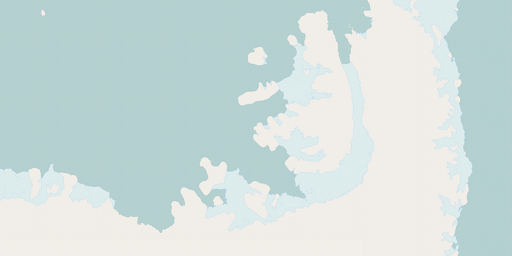 It is generally better to render the map directly from the OSM data which is somewhat more tricky to implement since the ice is not explicitly mapped as polygons and can also be computationally more expensive. The approach i introduce here should be understood as an easier shortcut to get correct depiction of the ice without the need to make more elaborate and region specific adaptations to the style. What this processing does is essentially determining which of the land areas inside the coastline are not covered by any non-ice polygons or explicitly mapped glacier polygons – the latter being primarily the ice shelves. The processing script is available on github and processing results for use here. They consist of polygons for the ice covered areas and outlines of those as shown below. Chris, do you have an image that shows the entire Ross Ice Shelf?